I spotted an interesting snippet on lightstrike in the Handbook of Brewing the other day. "The reaction requires activation by near UV, blue light and is also believed to require an electron-like transferring cofactor such as riboflavin. 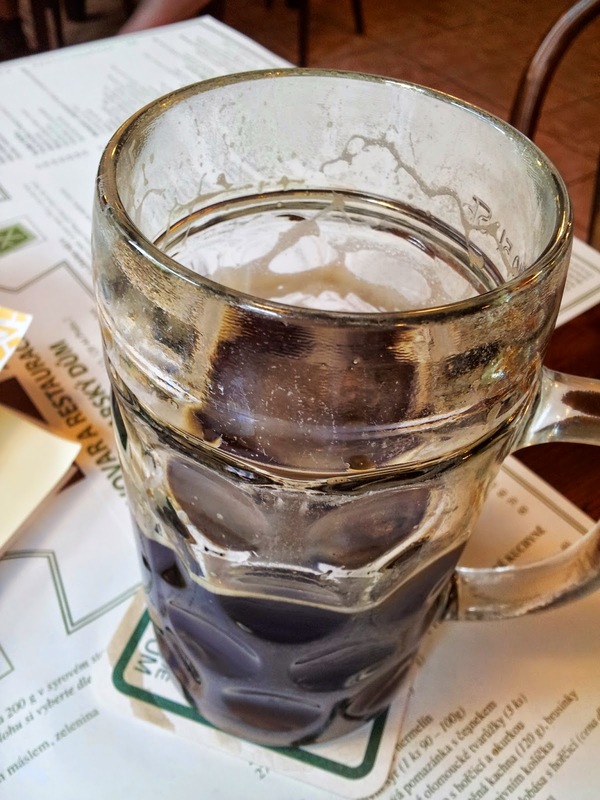 Interestingly, the reaction is blocked by molecular oxygen, which perhaps explains why outdoor drinkers of beer on a sunny day do not often complain of skunky taints forming in their beer." I hadn't heard that before, and as ever it seems more research is necessary. After my freelance research in Prague it was back to the day job. I was visiting the Research Institute of Brewing and Malting. Arriving in the morning we were offered a choice of refreshing beverages: tea, coffee or beer. As there was no kettle in the hotel room I was severely lacking in tea so went for that. I did have a beer later though, it would have been rude not too. 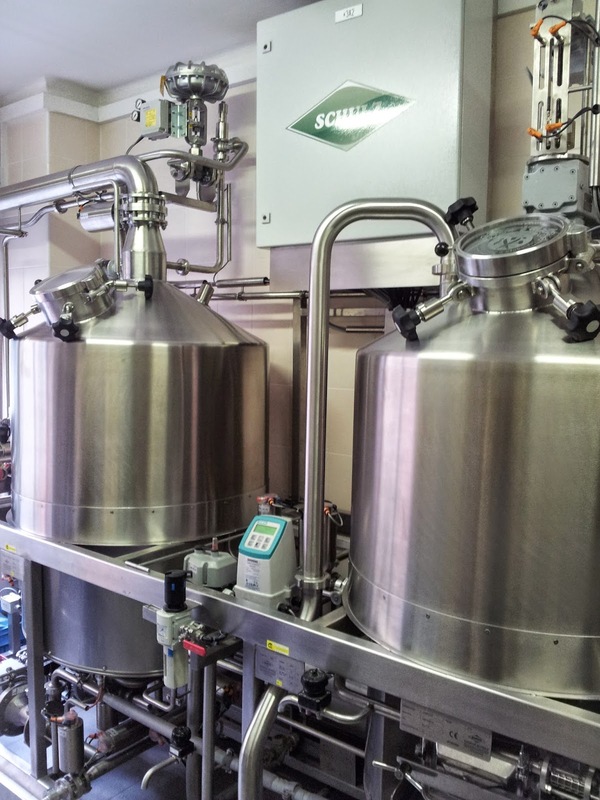 The malting part of the institute is in Brno, with lots of lab equipment and two pilot breweries in Prague. 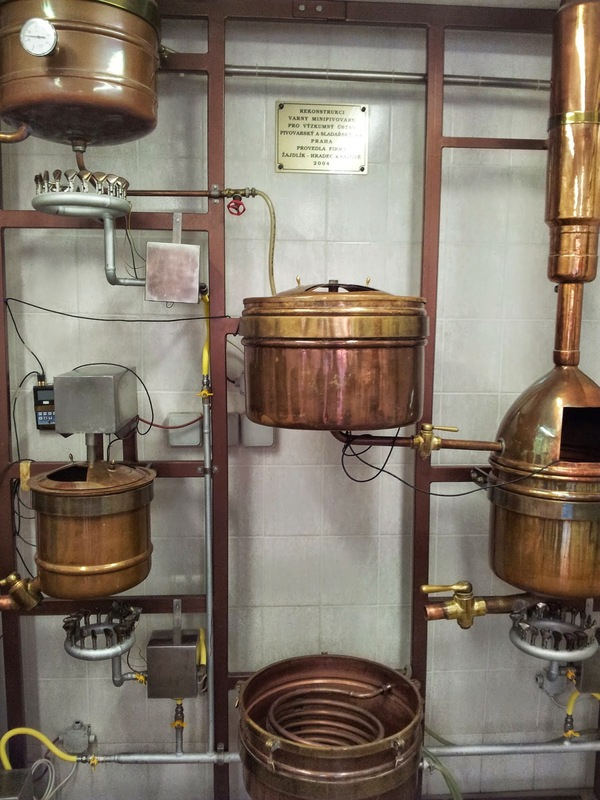 The small one (50L), which is soon to be replaced, had the look of something made by a keen home brewer, though all in copper. 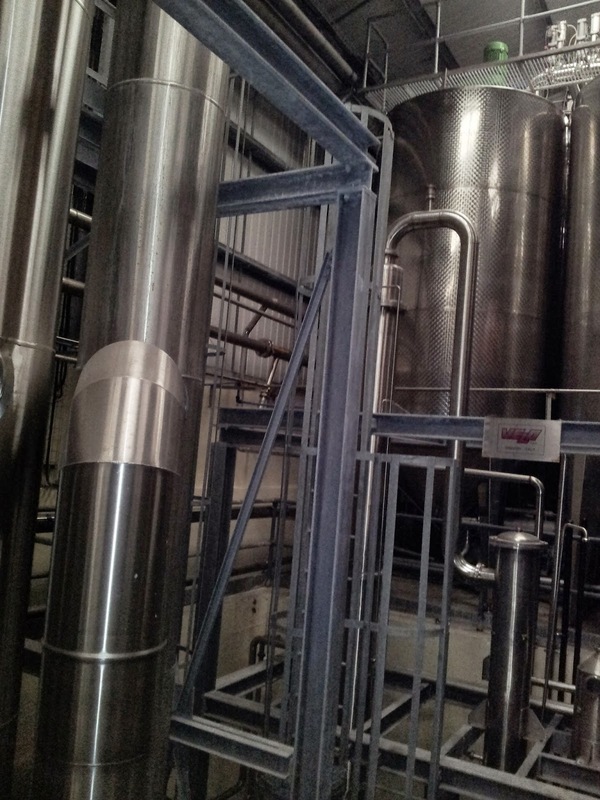 The larger one (300L) was an altogether more modern affair and looked more like a scaled down big brewery. Though they still seemed to do their fermentations in temperature controlled fridges. 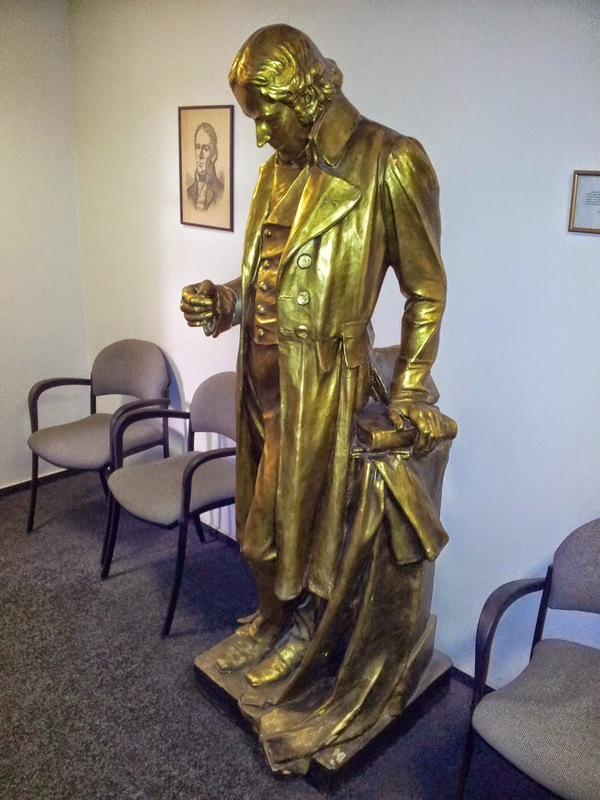 They had a big gold statue of František Ondřej Poupě, which is definitely a step up from having a Horace Brown portrait. 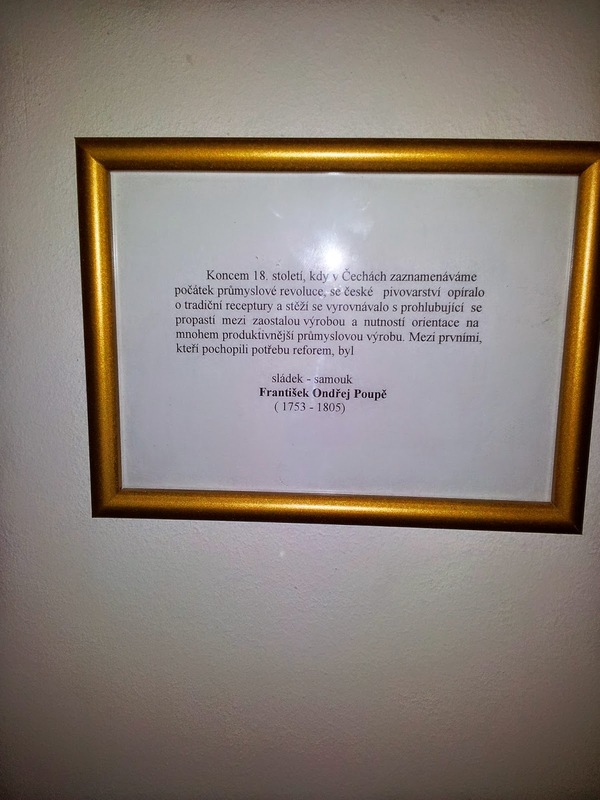 Poupě was an early Czech brewing scientist, who adopted the use of the thermometer. I was there as part of a project about a multi-use sensor, which will include temperature monitoring, so I think Poupě would approve. Being there for work I only had limited time for freelance research but the Pisshead's Guide proved to be a great help. After wandering around the main touristy bits the thoughts of my colleague and I turned to refreshment. 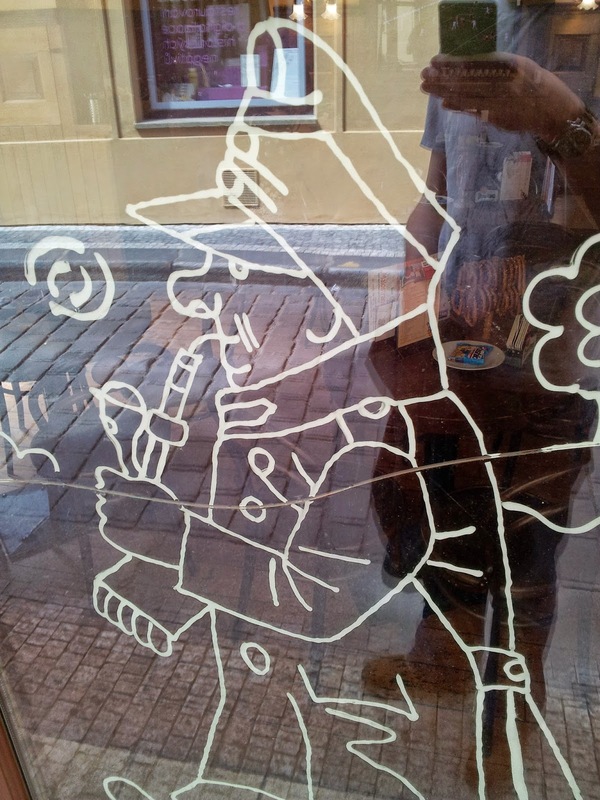 We had passed a Good Soldier Švejk bar in our wanderings which appealed, what with Jaroslav Hašek being one of us, even if he did briefly go Bolshy. 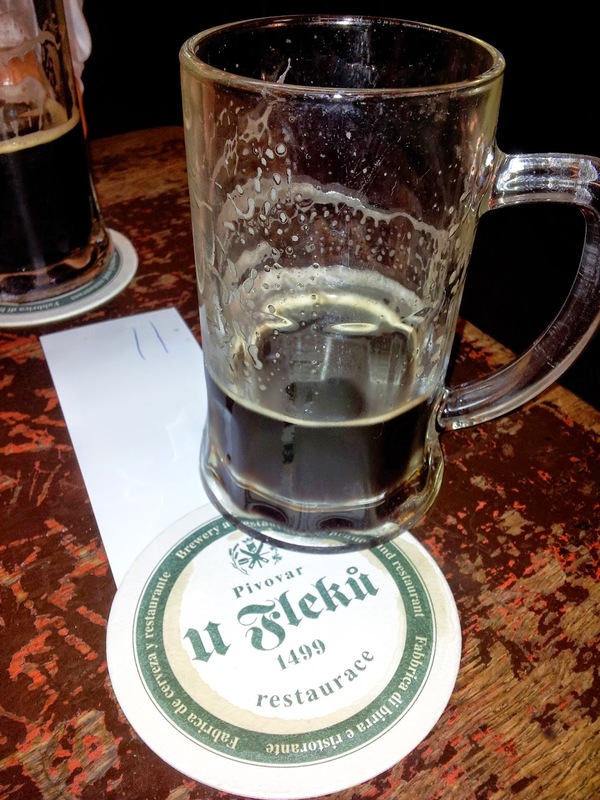 But I decided to start at U Fleků, the chance to drink in a pub that's been brewing since 1499 proving irresistible. Over the years the place seems to have developed into a highly efficient operation for fleecing tourists and the Pisshead's Guide proved invaluable in preventing us being parted with excessive amounts of cash. Soon after we'd settled down with our beers a waiter tried plonking shot glasses in front of us, but forewarned is forearmed, and as we were expecting this we waved him away, despite his repeated attempts to foist unwanted drinks on us. I couldn't really relax as the Guide also warned they'd try and bring us unordered pints too, which sure enough they did, but some slick footwork and swift payment to another waiter lead to us being at the door before our 'helpful' friend could return with more beer. The beer was good but after my experience there I wouldn't recommend it as a place to visit. We called in at another brewpub next, Pivovarský Dům. Things were altogether more relaxed here, though it was perhaps not the best of choices as it turned out the Brewing Research Institute my work was with was part of the same building so we ended up back here later. Still, I liked the place so it wasn't too much of a hardship. The best was saved till last though, and we'd never have found the place without the Guide. Located beside a three lane carriageway, and with closed doors and blacked out windows Kulový blesk did not look appealing. In fact we thought it was shut until we saw someone walk in. But once we'd entered we were soon in a sunny courtyard and away from the traffic. It was great. They don't brew here but had the best beer range of the trip. 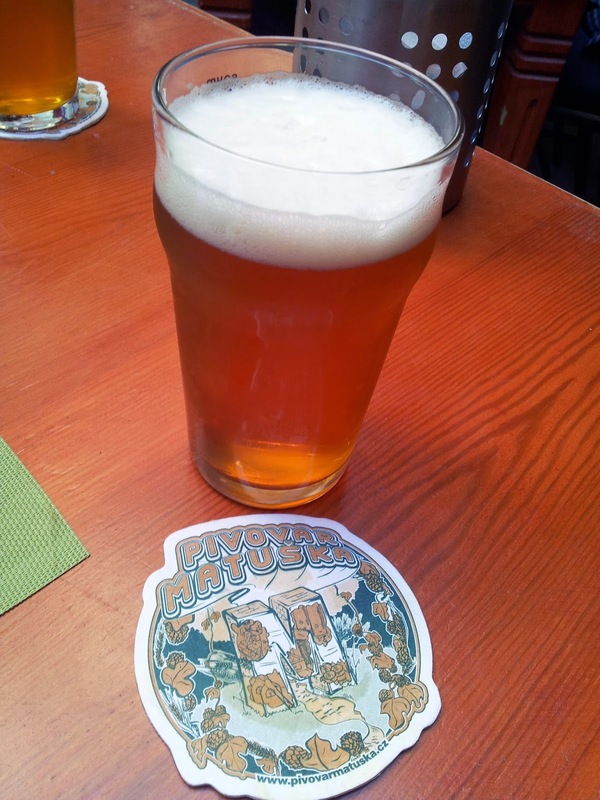 I started with a Matuška, which I suspect was an ale, as it tasted of American hops and surely no one would got to the trouble of making a lager with an overwhelming taste of grapefruit? 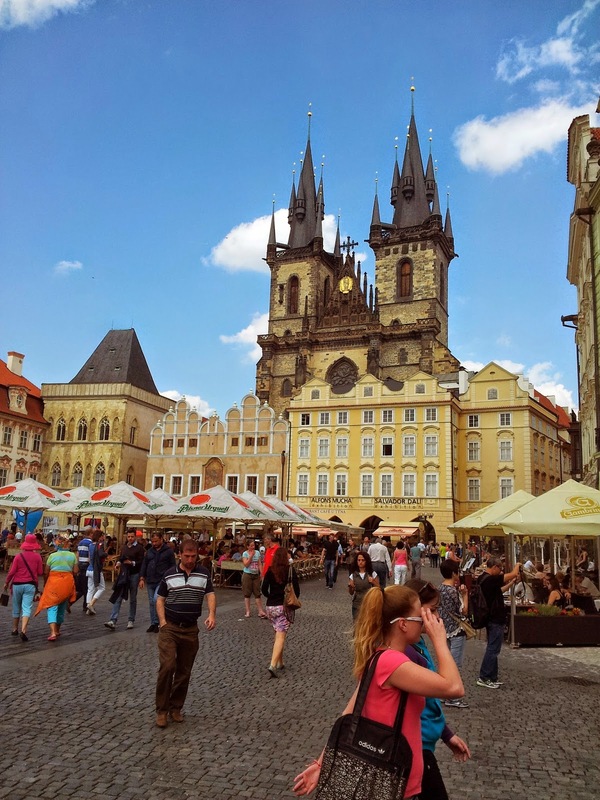 Being in Prague it wasn't quite what I was looking for but the next beer did the trick. A pale, hazy lager with mouth coating bitterness it was the beer of the trip. They need to look at their fining regime though. 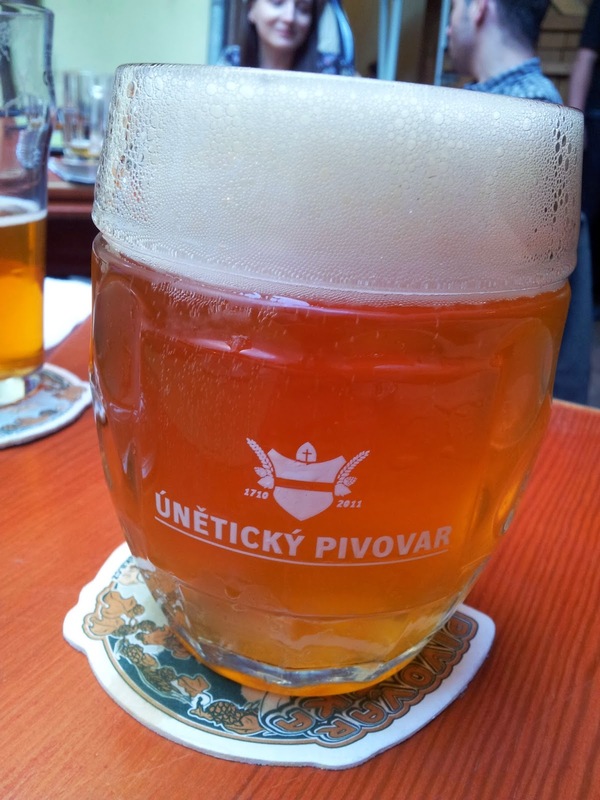 If the glass was right it was from Únětický pivovar. Great tasting, I could have gone exponential on this one, but with work related research the next day we left it at that and headed back to the hotel. 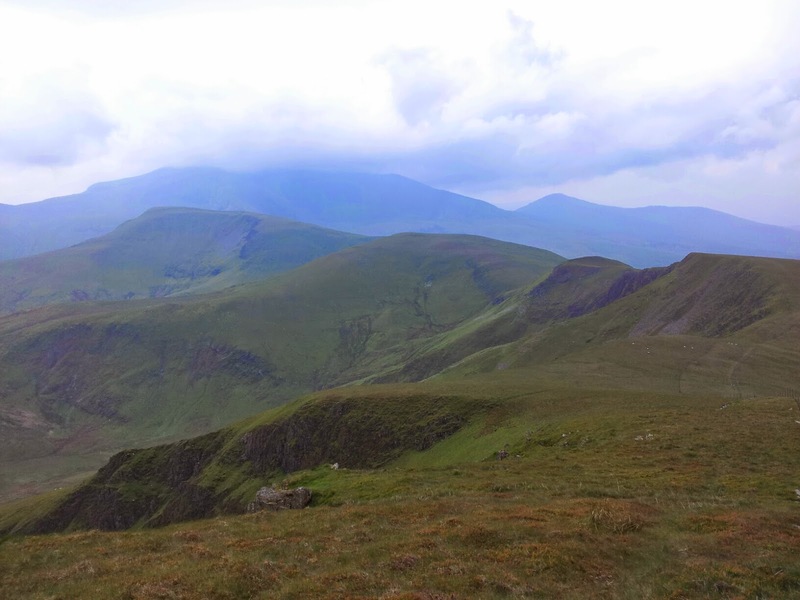 My last climbing trip was not hugely successful as there was an awful lot of rain about. 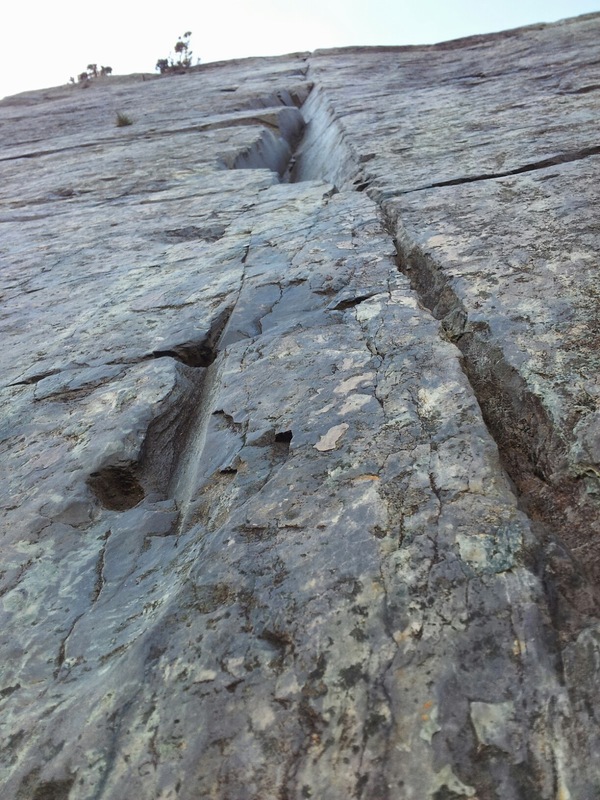 I did manage to bag another E point though, and had my first go at climbing on slate, which was good but unrelenting. But enough about that, you're only here for the beer. 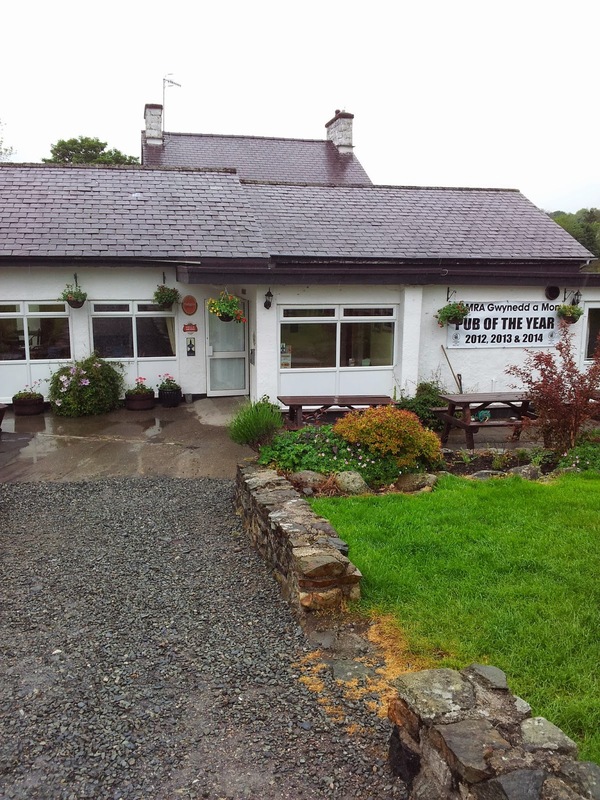 On a wet day, whilst failing to find anywhere dry to climb I spotted a brewpub in the valley over from where we were staying. With more rain forecast we decided to hoof it over there the next day. The pub reminded me of a social club more than anything, though I don't know if any clubs have breweries. The staff were very friendly, and though I doubt the beer would have got my fellow beer nerds as excited as say, canned beer being on sale in Wetherspoons* it was very welcome. I stuck at two pints though, I had a long walk back. * I still don't get that one. The Session is that time when beer bloggers get to the pub early and drink weak beer until chucking out time. Or something. It's not often I take part, but the latest one gave me an idea about what to do with some beer I had in my fridge. I'd ended up with a pint or so of cask beer poured two days earlier, and a can of European lager. Neither were very appealing but with the thought of beer mixing in my mind a drink a friend had told me about after working as a barman in Birmingham suggested itself as a possibility: The Mickey Mouse. A mixture of lager and bitter it sounds like mickey mouse drink so was not something I'd tried before. Reaching for my big glass I mixed the two beers and inspected the contents. 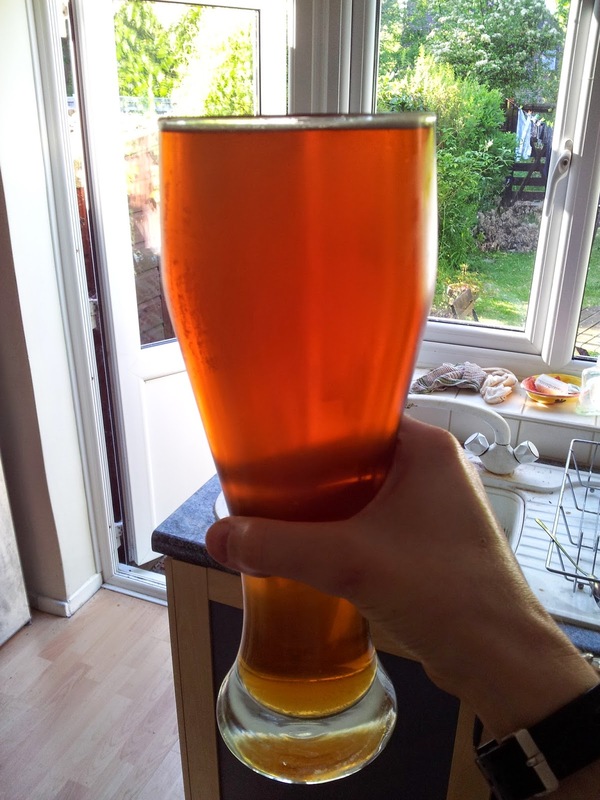 A pleasing amber colour, the fizz from the can pepped up the tired cask beer, and the mix had lost the unpleasant vegetable flavour you get in lagers. It tasted like a light ale and went down surprisingly well. Who'd have thought it, the Mickey Mouse is better than the sum of its parts.Oh boy! I drinks it all of the day. Well, when I say 'all of the day' I mean 'occasionally'. Though when I say 'occasionally' I mean 'once'. 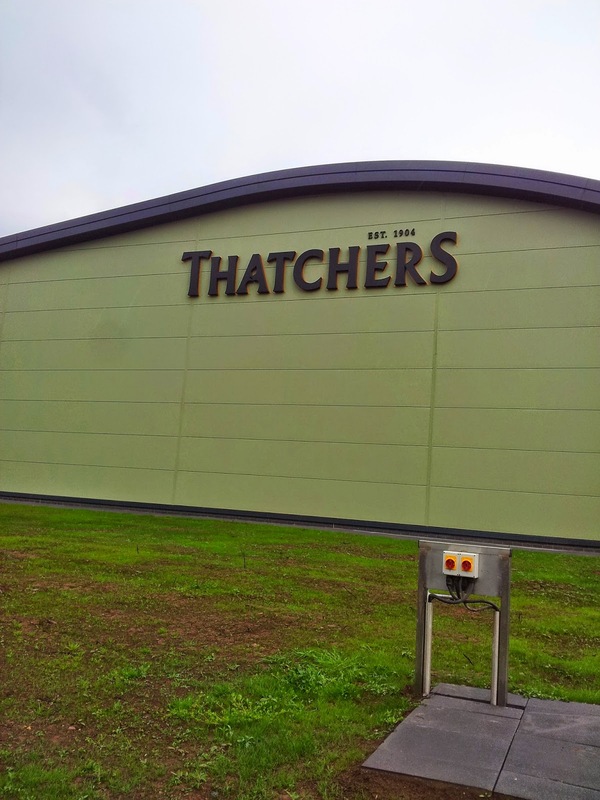 I was at Thatchers Cider though so it would be rude not to. The IBD had a meeting down there the other week. I was bleedin' miles from civilisation, which is perhaps why fruit based beverages are popular there instead of more wholesome malty alternatives. The company dates from 1904, which my impossibilist readers will realise makes it the same age as Britain's oldest Marxist party. Though they do grow apples there but many also come from elsewhere, it's a pretty hefty operation, similar in size to a large regional brewery. There's some very large kit, if I calculated rightly they make about 300,000 bbl worth of cider each year. Some of the ciders are made with tannin rich cider apples, others with culinary apples and some are a mix. 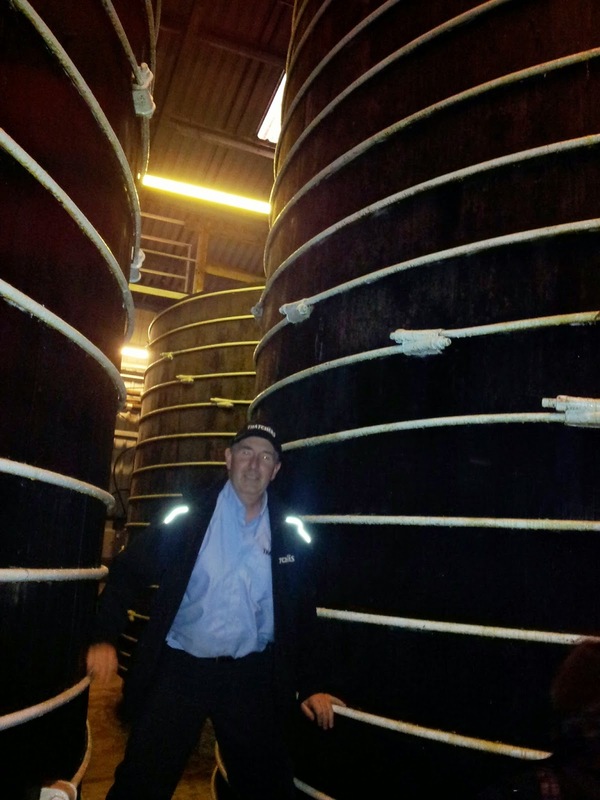 Having seen all the shiny modern kit I was rather blown away when we entered a modern warehouse and saw a load of old oak vats used for their vintage cider. Much as I'm reluctant to let the cider makers get one over on the brewers I have to say they beat the Greene King 5X vats. As to drinking the cider, instead of being a balance of malty sweetness and hop bitterness it's sweetness and tannic astringency that are balanced, or of course, not. I found them all quite palatable but it won't be enough to make me stray from the path of righteousness. "Although Bavaria and Bohemia are the traditional centres of the continental hop industry, it is to America that England looks, as a rule, for the major portion of its foreign supplies. Between 50 and 60 per cent of the hops exported from the USA have come to this country in recent years, and of America's total hop production about 35 - 40 per cent is exported. 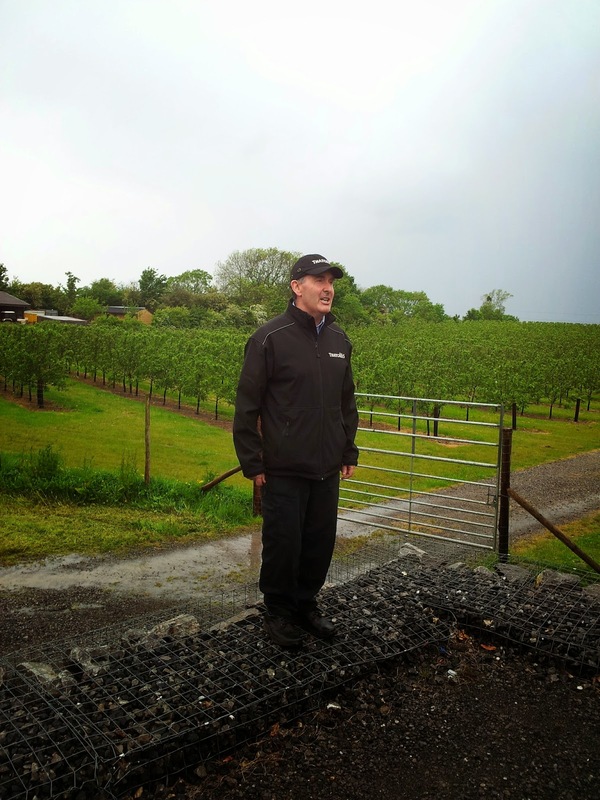 The dependence of the American hop industry on the English market is therefor apparent." The excellent book "The Hop Industry" by Hubert Parker contains some fascinating information on historical hop use. The use of American hops in British beer started long before people wanted beer that tastes of grapefruit. "... in these early years of large importation in the mid-century, Belgium, the Hanse towns and the USA were the places of origin. Later in the century the largest supplier of foreign hops was the USA, with Belgium second and German third. In 1900, out of an average annual import of about 200,000 cwt., about 150,000 cwt. appears to have been the average consignment from the USA, while Germany and Belgium would probably constitute as a rule about 12,000 cwt. 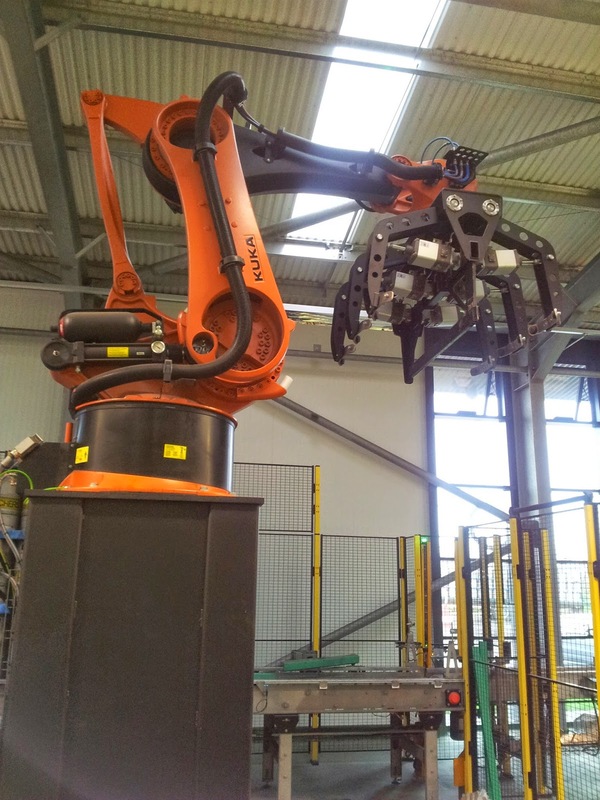 and 35,000 cwt. respectively. The continuance of importations of this magnitude of hops which, though generally lower in price than English hops, were not, except perhaps as to a small proportion, cheap hops, indicates clearly the change that was entering into English brewing practice. Up to, say, 1860 English brewers were content with English hops. Thereafter, a mixture of foreign hops has been demanded. For supplies of these foreign hops, the largest quota came from America, whose hops in earlier years, it is curious to note, were esteemed indifferent hops of unpleasant aroma." 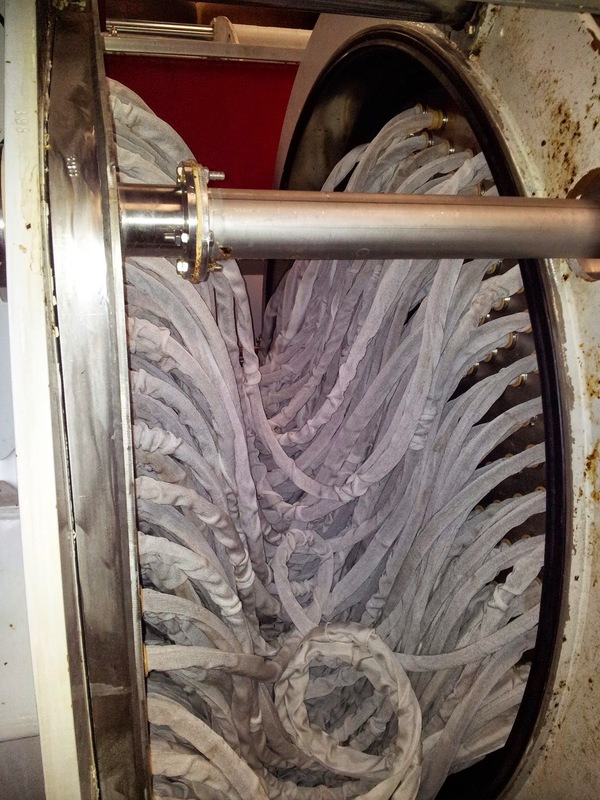 It's noted that American hops had high preservative value, i.e. alpha acid content, which is why despite reservations about their flavour English brewers were keen to use a proportion of American hops. 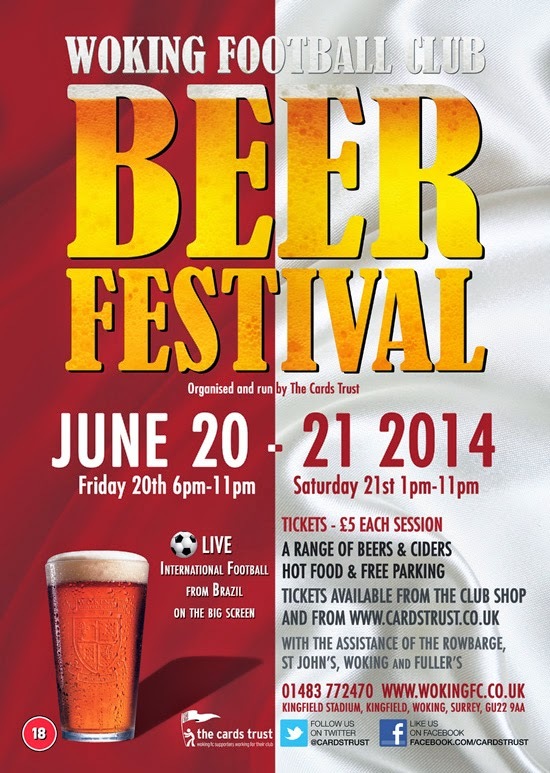 Another highlight of the local beer calendar is rapidly approaching: Woking Football Club Beer Festival. As it's something I can walk to I'm looking forward to it, even if my ability to walk home might be a little impaired by the time I'm done.